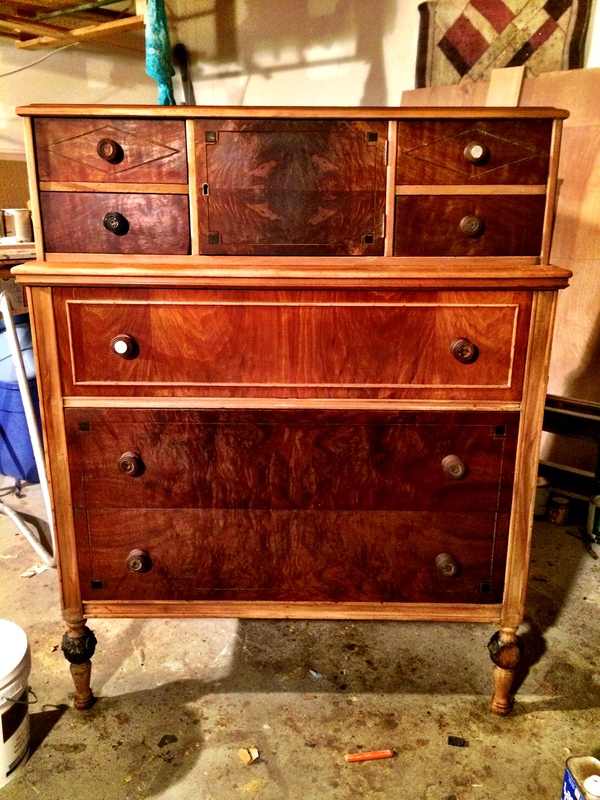 In keeping with the little mysteries around the house lately, here is one about a dresser we recently purchased. Hubby wanted us to stop by Habitat for Humanity resale store to see if they had anything or ideas. It did have some furniture and an armoire that would work in lieu of making storage crates. We decided that Daddy Pops would be best to check it out as he knows the folks at the store (he shops there alot) and he can get the senior discount. When we got home, hubby asked if we had gone to the ECHO (Evergreen CHristian Outreach) resale store up here as they were having a big furniture sale as well. We hadn’t, as we were not aware. So hubby and I got into the car and went the few miles back into Evergreen to see what we would find. We did find a better armoire than Dev and I had seen at Habitat, plus we found an old dresser that we could use in the guest room downstairs. We liked the old detail and layout of the old dresser. It looked as though it might have had a mirror or something on top at one time, but it would be fine for where we needed it. When we got it home, hubby thought he might strip some of the old stain off to refresh it a bit. 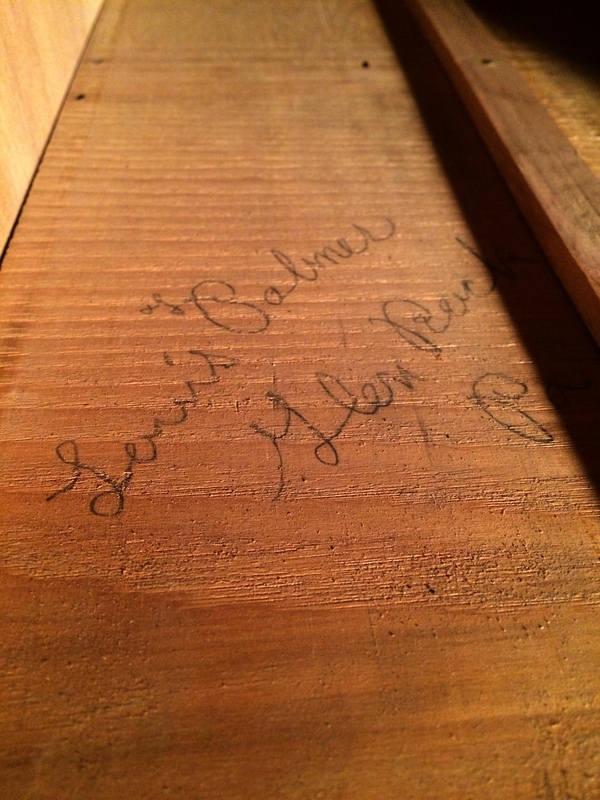 Inside the dresser on the wood below where one of the upper small drawers resided was our next mystery. In pencil was some writing. A name of the owner? The furniture company? Someone in Glen Rock, PA.
What kind of story did it possess to have made it to our little town in CO? Maybe one of you can discern the name better than we can. Just a bit of stripping of the old stain was enough to find out that it wasn’t one overall dark color as it had previously looked to have had, but a blend of light and dark woods. He is still tinkering with it – it is his nature – but this is how it has come out thus far. There are opal style inlays in the drawer knobs that we need to find replacements for (yet another mystery as to where to find them), but it has turned out nicely for an inexpensive resale find. After all, everything was 75% off that day.